With a job market that places great value on candidates with college degrees and tuition rates at an all-time high, the cost of higher education is one of the major issues facing today's students. According to the National Center for Education Statistics (NCES), the average undergraduate paid $21,003 in annual tuition during the 2013-14 academic year. This figure represents a 12.3% increase from five years earlier, and a 28.4% increase over the previous decade. A 2016 study by U.S. News & World Report (USNWR) also noted a 3% bump in tuition rates from the previous year for students attending public and private four-year universities. Many budget-minded students are choosing cheap online colleges and universities over traditional brick-and-mortar education. Costs are comparable for the cheapest online colleges and traditional, on-campus bachelor's programs for in-state students. However, online students stand to save much more in tuition costs than out-of-state students at public schools and students at private colleges and universities. The most affordable online colleges also cut out the need for commuting costs, and students can usually arrange internships and practicum courses at sites near their residence. Additionally, online students can save money on room-and-board by forgoing on-campus housing and choosing to live at home with parents or guardians during their studies. It's important to note that âcheapest online bachelor's degrees' and âaffordable online colleges' do not translate to lower academic quality. 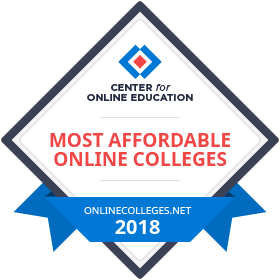 The schools featured on our ranking of the 50 most affordable online colleges and universities exemplify the idea of âaffordable, yet valuable' college education. These institutions offer degree programs that are on par with the best brick-and-mortar colleges and universities in the country, while also maintaining relatively low costs for students. Our 50 cheapest online colleges and universities are featured below. 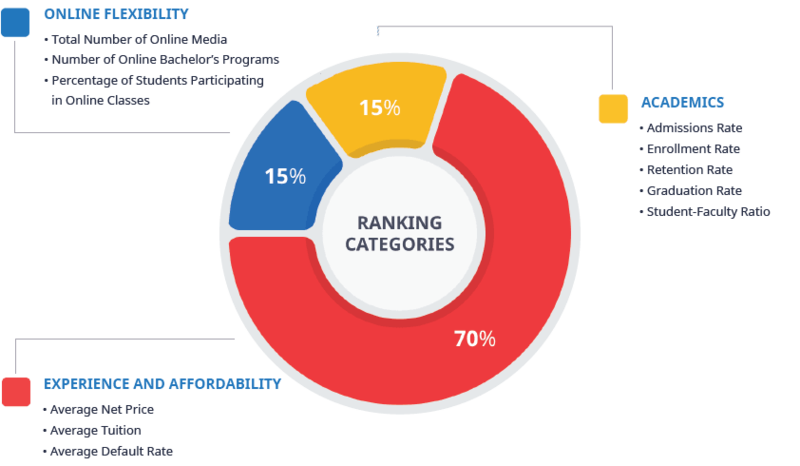 Read on after the list to learn more about the precise methodology we used to generate our ranking for the most affordable online colleges. According to new data, 56% of UF students graduate without debt. This is partly due to the university's relatively low in-state tuition rates; during the 2015-16 academic year, undergraduates from Florida pay $6,380 for full tuition and fees, while graduate students from Florida pay $12,740. Distance learners who take courses through UF Online also stand to save more money than traditional students. Online students pay an average of $3,876 in annual tuition, and yearly expenses for students who live at home are estimated at $8,866. UF has long been a leader in online education. The university currently offers more than 100 undergraduate and graduate degree programs that are exclusively or partially delivered online. Other online degree options include 77 master's programs, many of which feature a variety of specializations, and 10 doctoral programs. In-state students at Fort Hays University pay a low tuition rate of $4,883.70, or $162.79 per credit hour. A discounted tuition rate of $6,778.20 per year (or $225.94 per credit hour) is also offered to students from states participating in either the Midwest Student Exchange Program or the Contiguous State Resident Tuition Program. Fort Hays State is home to an extensive virtual college. Students can pursue one of 29 online bachelor's degrees, including new programs in accounting and computer science. Additionally, three bachelor's major subjects -- business education, education, and information networking/telecommunications -- are available. Other online options include 15 master's degrees (13 of which are exclusively online), a doctorate of nursing practice, and a specialist in education credential. Dickinson State offers discounted tuition rates to residents of Colorado, Minnesota, Missouri, Montana, Nebraska, and Oklahoma, along with Saskatchewan and Manitoba. Distance learners pay the same tuition rate as in-state residents, regardless of their current location, although online courses carry an additional access fee of $48.50. Dickinson State offers nine degree programs that can be completed entirely online. These options include two AS degrees concentrated in agriculture and four BS degrees in business. Most web-based courses are taught asynchronously; students are advised to spend approximately 3-5 hours studying per credit, each week. WGU is a nonprofit online school with a national enrollment of more than 72,000 students. The school has not raised tuition since 2008; although tuition rates vary by program and degree level, most students pay between $5,780 and $6,500 annually. Students earning a BS in nursing have to pay a bit more, as their tuition amounts to $8,500 each year. The school's website features a tuition comparison tool, revealing the significant cost difference between WGU and other, pricier online colleges and universities. All programs at WGU are delivered exclusively online. The school offers undergraduate and graduate degrees in four core academic areas: education, business, information technology, and healthcare. The selection for aspiring teachers is particularly robust, as WGU provides more than 30 pathways for licensed and unlicensed educators. Hobe Sound offers several discounts that helps make college more affordable for incoming students. High school valedictorians receive up to $1,000 per year for four years, and salutatorians receive an annual $500 credit. As a faith-based school, Hobe Sound also offers a 20% discount in tuition and room and board to students with at least one parent in a religious career. Students will also receive a $500 credit for every individual they influence into applying to and enrolling at the college. Online students at Hobe Sound can earn associate or bachelor's degrees in secular and religious academic subjects. Popular faith-based options include programs in Christian studies, Bible with a ministerial emphasis, and Christian counseling. Education degree programs are also offered for prospective teachers. The smallest educational institution in the University of Texas system, this Odessa-based university offers a fixed four-year tuition plan for all students -- allowing them to save up to $4,000 in educational costs by the time they graduate. In-state students pay roughly $218.73 per credit hour, which amounts to $2,624.86 for 12 course credits (or one standard semester). The tuition rate for out-of-state students is $6,968.86 per semester. The university's online academics include standard bachelor's and master's degree pathways, along with accelerated undergraduate tracks in communication, humanities, psychology, sociology, management, marketing, and RN-to-BSN. The bulk of UTPB's online master's programs are concentrated in education, with pathways dedicated to niche areas of teaching like ESL, special education, and educational leadership. MBA and MPA programs are available to distance learners as well. Tuition at the University of Nebraska at Omaha is much less expensive than average. According to CollegeBoard, the average in-state student paid $9,410 in tuition and fees during the 2015-16 academic year, while out-of-state residents paid $23,893. At UN-Omaha, in-state residents paid $6,898 for tuition during the same year, while out-of-state students paid $18,610. Additionally, the school offers MavCENT$, a financial literacy program designed to help students manage their expenses. Online bachelor's students can pursue 10 different web-based undergraduate degrees, including popular programs in criminology and criminal justice, fire service management, geography, gerontology, and library science. Some of these programs are offered entirely online, while others adhere to a hybrid format. Online concentrations are also available in fields like assurance, aviation studies, and nonprofit administration. Six online graduate degree programs are offered as well. ECU offers exceptionally in-state tuition rates for online students: $163.48 per credit hour for undergraduates, and $244.71 for graduate students. ECU also boasts a very low 3% loan default rate. Full-time students with hybrid course schedules are billed at a flat tuition rate of $2,182.50 for 12 credit hours; this fixed rate allows students to potentially save money by enrolling in additional courses each semester. Since adopting an online platform, ECU has designed more than 75 degree and certificate programs for distance learners. The website currently lists 16 online bachelor's programs, including three education-oriented degrees for students transferring from community colleges. ECU also offers programs in business, management, and industrial technology. Graduate students can pursue a master’s degree in 21 different subjects; the education, nursing, and technology pathways each include several sub-specializations. Other options for online learners include graduate certificates and post-master's certificates. Minot State maintains a relatively low annual tuition rate of $6,568 for all undergraduates, regardless of their state of residence; the tuition rate for graduate students is $8,241. Full-time online undergraduate students pay $266.26 per credit hour (including an access fee), which amounts to less than $4,000 per semester. Minot State's distance education platform features eight online bachelor's programs, including four business-related degrees, a BS in nursing program, and a program that focuses on serving intellectually and developmentally disabled individuals. Online graduate students pursuing degrees in special education can choose from five specializations, including developmental disabilities/autism spectrum disorders and deaf or hard of hearing. Master's degrees in management and information systems are also available to distance learners, along with a graduate certificate in knowledge management. Valley City State is a small North Dakota university with an enrollment of 1,422 undergraduate and graduate students. In addition to North Dakota residents, VCSU offers in-state tuition rates to students from 22 other states, as well as the provinces of Manitoba and Saskatchewan. For those who are ineligible for the aforementioned discount, tuition amounts to $14,103 per year -- nearly $8,000 less than the national average for out-of-state students. VCSU offers nine online degree programs. These include an undergraduate technology education pathway, the first of its kind in the country. Other options include four other undergraduate degree programs in education (business, career/technical, English and history), along with degrees in business integration process management, music, and professional communication. An online ME degree and two graduate-level certificates in ELL and library IT are available as well. Under the Hazlewood Exemption, military veterans from Texas may receive exemptions for up to 150 credit hours at Texas A&M. The university offers additional tuition exemptions to other groups, including students who were previously in foster care, blind and deaf students, and students who are the children of deceased police officers and firefighters. The state of Texas also offers in-state tuition rates for all graduates of Texas high schools, regardless of their immigration status. Distance learner tuition rates will vary by academic department; a full list is available on the school's website. Most of Texas A&M's online offerings are graduated programs. These options include degrees in agriculture and life sciences, 16 degrees in education and human development, and 11 degrees in engineering. Other web-based options include RN-to-BSN and RN-to-MSN programs, along with other healthcare-related pathways. All incoming freshmen at UNC Greensboro who complete an application essay will qualify for Blue & Gold scholarships, which are renewable merit-based awards given to up to 30 recipients; scholarships range from $1,500 per year to full tuition, fees, and room and board. The school also offers dozens of institutional merit- and need-based scholarships and grants; student eligibility for individual awards may also vary on other factors, such as the candidate's gender, race, and academic discipline. Online courses at the university cost less than brick-and-mortar courses. UNC Greensboro's online offerings include seven bachelor's programs, ranging from liberal studies and philosophy to public health, business administration, and supply chain management. With the exception of public health, all undergraduate programs are delivered entirely online; some are self-paced, while others adhere to a set schedule. Distance learning programs for grad students include 10 online master's degrees, a specialist degree in educational leadership, a doctorate in kinesiology, and 14 graduate certificates. Online students at UCF pay lower tuition rates than their on-campus counterparts. In-state distance learners pay $5,028 in annual tuition for undergraduate courses, while out-of-state online students pay $20,740 in annual tuition. Students who were adopted or previously in foster care may be eligible for tuition and fee exemptions; the university also waives tuition and fees for combat veterans and children of firefighters and police officers killed in the line of duty. Although UCF does not offer any undergraduate degree programs online, the school does have a variety of web-based minor and certificate options. Nearly 30 online minors and undergraduate certificates are available in five academic disciplines: arts and humanities, education and human performance, health and public affairs, science, and hospitality management. In-state undergraduate students at the University Houston pay $6,970 in annual tuition, while out-of-state undergraduates pay $16,330; both of these figures are significantly lower than the national averages for undergraduate tuition. UHD also offers five renewable scholarships of $1,500 apiece to incoming freshmen who meet certain criteria, as well as five renewable scholarships of $1,500 for students transferring from community colleges. The school also offers a fixed-tuition plan for incoming freshmen, which allows them to pay for courses at the same per-credit rate for four years of education. UHD's online program features 15 undergraduate degrees and three graduate programs. These include eight business administration programs, three bachelor's and one master's degree offered through the College of Humanities & Social Sciences, an MA in teaching, and three criminal justice programs. Credit hours at UA Fairbanks are priced per course level, which reduces the overall cost of attendance for undergraduates in their first two years. Alaska residents pay between $192 and $232 per credit for all classes ranging from the 100 to 400 levels. The school also participates in the Western Undergraduate Exchange program, allowing students from 15 different states (as well as Guam and the Mariana Islands) to pay lower tuition than other out-of-state learners. Distance learners at UA Fairbanks can earn online bachelor's degrees in business administration, homeland security/emergency management, and justice; each program requires students to complete 120 credits. Four master's degrees are also available online, as are five associate degree programs, five professional certificates, five occupational endorsements, and 14 minors. Tuition for all USU students is billed at a flat rate from 12 to 18 credits, allowing students to enroll in additional courses each semester without paying extra. In-state online undergraduates pay the same tuition rate as their on-campus counterparts, $2,906 per semester for 12 to 18 credits. The university also offers 11 in-state and non-resident scholarships for incoming freshmen; awards vary from a full tuition waiver for four years to a 25% tuition discount for one year. Seven online bachelor's programs are offered to distance learners. These options include degrees in agribusiness, communicative disorders and deaf education, economics, family life studies, and psychology. The school also offers a variety of master's programs, including popular programs in English and human resources, and niche subjects like dietetics administration, horticulture, and rehabilitation counseling. Online undergraduates at ULM are billed at a flat rate of $400 per credit hour, while online grad students pay $500 per credit hour. These figures include all tuition and fees; with a few course and program exceptions, online students will not be assessed any additional fees or other charges. The university also offers a discounted tuition rate for its organizational leadership online program; students are billed at a rate of $975 per course, and most complete the program in less than two years. ULM's online degree programs include bachelor's pathways in business administration, nursing and healthcare, education, and a variety of liberal arts subjects. Each bachelor's program requires students to complete 120 to 125 credits, and can be finished within four years. An online associate of general studies degree is also available. Graduate students can pursue 18 web-based master's degrees, along with doctorates in philosophy and education. The "Tuition Waiver" program at this Pensacola-based school allows students from out of state to save money on tuition. Eligible undergraduates receive a 75% discount on their out-of-state tuition surcharge fees, while grad students get a 90% discount. Additionally, active-duty and reserve military personnel get to pay in-state tuition. The school's online programs include a mix of core subjects and niche areas of study. Web-based bachelor's options include an RN-to-BSN nursing pathway and degrees in IT and health sciences, as well as programs in maritime studies and exceptional student education. Advanced programs include 16 master's degrees, and doctoral and specialist degrees in curriculum and education. UWF also offers 500 standalone online courses. UIS's website features a four-year tuition schedule for on-campus and online students. The site also includes a net price calculator, which allows prospective students to estimate their total expenses. They can also use a calculator for adding up tuition and fees, and a "Freshmen Cost and Scholarship Estimator" tool. UIS offers a range of academic programs for online students. Undergraduates can earn degrees in 12 fields, including four pathways in tech-related disciplines like computer science and management information systems. Graduate students can choose from a dozen fields of study as well. These options include three degrees in technology and two in environmental science. Ten online certifications in education are also available, as are 13 graduate-level certificates. FIU's tuition rates for in-state and out-of-state residents are both thousands of dollars below their respective national averages. Additionally, out-of-state distance learners pay less in annual tuition than traditional students. The rate for online undergraduates is particularly low at $9,990 per year -- nearly half the rate for on-campus undergraduate students. FIU allows online bachelor's students to choose from 21 degree programs, many of which are concentrated in either business or liberal arts. An RN-to-BSN pathway is also offered online. Web-based options for graduate students include 19 master's degrees and a doctorate in nursing practice. Undergraduate and graduate certificates are also available. A rotating pool of free massive open online courses (MOOCs) are also offered across various fields. MSSU allows distance learners from Kansas, Oklahoma, Arkansas and certain counties in Illinois to enroll in online courses and pay in-state tuition. With this discount, annual tuition amounts to approximately $7,230. Furthermore, out-of-state tuition rates at MSSU are significantly lower than the national average; on-campus out-of-state students pay $11,282.60 per year, while online out-of-state residents pay $12,636.60. Bachelor's programs for distance learners at MSSU include degrees in business administration and five health science pathways. Online undergraduates can also pursue 17 web-based bachelor's minors; 11 of these options are in business-related fields, and four are in law and criminal justice. Online certificates in entrepreneurship, environmental health, management, and paralegal are available as well. Tuition rates for in-state and out-of-state students at IUE fall below the national average; in-state residents pay $7,072 per year, while out-of-state students are charged $18,682. The university has managed to significantly lower the loan default rate among graduates. In 2010, the three-year default rate stood at 20%; three years later, it had decreased to 9.4% -- nearly two percentage points below the national average. IU East Online offers a dozen online bachelor's degrees for undergraduates, and features programs in business administration, communication studies, technical/professional writing, and an RN-to-BSN pathway for nurses. Online graduate certificates are also available in composition studies, early childhood teaching, mathematics, and online instruction and assessment. Out-of-state students at Nicholls State do not pay higher per-credit tuition rates; instead, they must pay a surcharge ranging from $1,821.88 to $5,465.64 each semester. Out-of-state tuition waivers are available for certain students, as well. A list of student fee exemptions at Nicholls State can be found on the school's website. NSU also participates in the TOPS scholarship program, which helps high school graduates who do not qualify for federal grants pay for college. The school also offers merit-based scholarships for incoming freshmen. A total of seven online bachelor's degrees are available for distance learners, including an RN-to-BSN pathway and three liberal arts programs. Associate degrees in petroleum services and safety technology are also offered, as is a master's degree in curriculum and instruction and a post-baccalaureate certificate in applied business administration. This Columbus-based institution, commonly referred to as 'The W' in Mississippi, offers the lowest tuition among all public colleges and universities in the state. A range of students qualify for out-of-state tuition exemptions; these include applicants from Alabama, Arkansas, Louisiana, and Tennessee; active-duty military personnel and veterans; students who have earned at least 90 course credits; and children and grandchildren of the school's alumni association members. These exemptions help students save as much as $5,285 in tuition costs per semester. The W offers a dozen "2+2" online bachelor's degree programs aimed at students who have transferred to the university after completing at least 90 course credits at a community college. These degrees include 10 fields related to business administration, a public health education program, and an RN-to-BSN pathway. Master's degrees in business administration and health education are also available to online students, along with eight certificates and six undergraduate minors. Tuition rates at Utah's Weber State University are significantly lower than average. In-state bachelor's students pay $4,611 for two semesters of full-time study during the 2016-17 academic year. Out-of-state residents pay $13,837, which is $10,000 less than the national average. Weber State's online integrated studies program is geared toward students who want to follow an interdisciplinary track. Candidates choose three areas of emphasis from the following subjects: child and family studies, computer science, health administrative services, health promotion, health sciences, nutrition, and professional sales. Online bachelor's degrees in health information management, medical laboratory science, and radiologic science are also available. Students can also pursue online associate degree and professional certificate options. Tuition rates for online students at FSU are much lower than the national average. In-state distance learners pay roughly $1,706 for a 15-credit semester (at a rate of $98.75 per credit hour), while non-resident online students pay less than $4,000 per semester. The same tuition rates apply to military service members attending FSU's satellite campuses at Fort Bragg or Seymour Johnson Air Force Base, as well. Online bachelor's degrees are available at FSU in seven fields: criminal justice, psychology, sociology, fire and emergency services administration, business administration, early childhood education, and RN-to-BSN. In addition to the online MBA, a master's in criminal justice program is also offered to distance learners. ENMU's tuition rates fall within the bottom 10% of all 81 public colleges and universities in the U.S. Southwest. Students from Texas whose homes lie within a 135-mile radius from the main campus get an exemption on their out-of-state tuition surcharges. Students in the Western Undergraduate Exchange Program also receive substantial discounts on their tuition. Out-of-state residents at ENMU pay roughly $11,285 in annual tuition -- more than $12,000 below the national average for out-of-state students. The university offers an extensive selection of online degree and certification programs. Options for web-based undergraduates include bachelor's degrees, minors, and certificates in 29 different disciplines, including some niche fields of study like aviation science, culinary arts, and personal financial planning. Additionally, 14 master's degrees and certificates are available, including 10 in education. In 2016, Western Carolina was selected to participate in the NC Promise Tuition Plan; under the proposal, the tuition rate for in-state undergraduate students, including distance learners, will drop to $500 per semester. The plan was designed to help schools with high enrollment attract students from underrepresented minority groups; eligible participants will save nearly $1,500 per semester in tuition expenses. Seven undergraduate degree programs are available for distance learners. Areas of study include business administration and law, entrepreneurship, emergency and disaster management, and an RN-to-BSN pathway. An eighth bachelor's program in engineering technology is offered in a hybrid format. Ten master's degrees and six professional certificates are available online as well. The annual tuition rate for in-state undergraduates at McNeese State is $6,209.50, while out-of-state undergraduates pay $17,419.50; both of these figures are much lower than the national averages. Louisiana high school graduates will be eligible for partial tuition waivers under the Taylor Opportunity for Students (TOPS) program; full-time undergraduates enrolled in at least 12 course credits will receive a $2,395.06 discount on their tuition every semester. The university also offers affordable room and board at an average rate of $2,500 per semester, although this amount will vary by individual housing and meal plans. Distance learners can choose from 14 fully online degree programs at McNeese State. These options include associate programs in paralegal and general studies, seven bachelor's degrees, and five master's pathways. Four online graduate certificates are also available, as well as post-bachelor's and post-master's certificates and an educational leadership specialist credential. Online students at Chadron State pay the same tuition rate, regardless of their state of residence. According to the school's online course calculator, distance learners should expect to pay $3,120 per semester for 12 credits of online study. Chadron State also eases payments for off-campus students by offering a flexible semester payment schedule; eligible recipients pay a $20 enrollment fee once per semester, and the payment plan is interest-free. Many courses taken through CSC Online are available in an accelerated, eight-week format. Undergraduates who pursue an online degree in business administration can choose from six different major specializations, while those earning a master's degree in education can pick from nine different concentrations. Fully online degree programs are also offered in mathematics, organizational management, and psychology; hybrid options are available as well. In-state students at Great Basin pay between $88 and $149.50 per credit hour for undergraduate courses, depending on the semester and course level. Additionally, students who enroll in summer courses do not have to pay out-of-state tuition. As part of the Western Undergraduate Exchange (WUE), residents of 14 western U.S. states and two territories will receive discounted tuition rates, as well. Great Basin's online programs include applied science bachelor's degrees with four possible emphases: land surveying and geomatics, digital information technology, graphic communications, and management in technology. Other undergraduate programs include an RN-to-BSN pathway and BA programs in English and social science. Fourteen associate degrees and 10 professional certificates are also available online. Tuition at St. Petersburg College is 53% lower than the average rate at state universities in Florida, and the average bachelor's degree recipient at St. Petersburg will pay only $37,580 for four years of full-time study. The college's website features a tuition price comparison tool, comparing costs against the rates of full-time study at three of Florida's leading universities. Surveys have also found that students who spend two years at St. Petersburg and then transfer into a different school's bachelor's program will save roughly $9,740 compared to those who complete all four years at another public institution. Distance learners pay the same tuition as traditional students. Web-based students can choose from eight bachelor of applied science degree programs in fields like dental hygiene, health services administration, international business, and veterinary technology. Four BS pathways are also available online, as are two dozen professional certificates, an autism endorsement, teacher certification reinstatement credential, and 15 fully online associate degree programs. UW Oshkosh offers reduced tuition to students from schools in the nine states participating in the Midwest Exchange Program. According to the university's online cost calculator, in-state residents pay between $7,500 and $8,000 in annual tuition. The on-campus UW Oshkosh Children's Learning and Care center offers affordable childcare services for students and faculty with young kids. Nine undergraduate degrees are available for online students at UW Oshkosh; fields of study for these programs include aviation management, fire and emergency response management, leadership development, and public safety administration. Online graduate degrees in data science, public administration, and sustainable management are offered as well. Bellevue students who are active-duty members of the U.S. Armed Forces or National Guard pay $250 in tuition per credit hour for all courses in certain academic fields. Military personnel also pay reduced tuition rates for Bellevue-sponsored courses taught at the nearby Offutt Air Force Base. Tuition for in-state undergraduates is priced at $285 per credit hour, which amounts to $8,550 for a 30-credit academic year -- more than $800 lower than the national average for annual undergraduate tuition. Bellevue offers a total of 75 online degree programs for distance learners. These include a robust selection of bachelor's programs, more than a third of which are in business. The school's emphasis on business extends to its online graduate program offerings, which include two MBA tracks, 15 other master's degrees grounded in business, and a PhD in human capital management. Online undergraduate and graduate students pay a flat tuition rate, regardless of their state of residence. With fees included, web-based undergrads pay $285 per credit hour, while online graduate students pay $301.23 per credit hour. In addition to in-state rates for North Dakota residents, the school offers discounted tuition to students from Minnesota and four contiguous Canadian provinces, as well as seven additional states under the Midwestern Higher Education Compact (MHEC). Mayville State offers online bachelor's degrees in seven academic fields. These include programs in business administration, early childhood education, mathematics, mathematics education, nursing, special education, and university studies. Students can also pursue associate degrees in business administration and early childhood education. The University of North Dakota offers reduced tuition rates for contiguous state residency, along with states in the Midwest Student Exchange Program and the Western Undergraduate Exchange. In all, students from 22 states, two Canadian provinces, and the commonwealths of Guam and Northern Marianas Islands benefit from the program. The university also offers partial or full tuition waivers to National Merit Scholars from North Dakota or Minnesota who select UND as their first school choice, as well as qualifying international students and students belonging to historically underrepresented racial groups. UND offers dozens of online programs, including 13 bachelor's degrees. Popular programs include a bachelor's in engineering with five available concentrations, an RN-to-BSN degree, and an accelerated BSN program for prospective nurses. Graduate students can choose from 25 master's pathways (including multiple education and nursing tracks), along with doctoral degrees, and more than a dozen graduate certificates. Distance learners at NSU pay a flat tuition rate for full-time, exclusively online enrollment, regardless of their state of origin. Currently, this rate amounts to $375 per credit hour for 12 undergraduate credits, with an additional $100 assessed for each additional credit hour. This means that online undergraduates pay roughly $9,600 for one year of tuition. Graduate students pay $475 per credit hour for up to nine credits, plus a $100 fee for each additional hour. NSU is home to the largest -- and first -- online campus in Louisiana. Undergraduates can pursue bachelor's degrees in 16 academic disciplines. Four of these options include specializations: criminal justice, family and consumer sciences, psychology, and public safety administration. An RN-to-BSN pathway is available for nursing students as well. More than 30 master's degrees are available online; most of these programs are concentrated in education. Indian River State College offers low tuition rates for all students. Currently, Florida residents pay $103.83 to $117.10 per credit, while out-of-state residents pay $390.49 per credit for low-level courses. Out-of-state tuition waivers are also available for military veterans and incoming freshmen (including undocumented immigrants) who attended a high school in Florida for at least three years prior to graduation. Indian River State's virtual college features four associate and nine bachelor's programs. The majority are concentrated in business or technology; these options include degrees in health information technology, IT management/cyber security, and organizational management. Other options include a general associate of arts pathway and bachelor's degrees in criminal justice, education, middle school mathematics, and nursing. All undergraduates enrolled at SUNY Empire State pay between $270 and $323 per credit. Online distance learners pay the same tuition rate as their on-campus out-of-state counterparts. The college also offers in-state tuition rates to active-duty military personnel, reservists, and National Guard members, as well as spouses and children from military families; these rates are applied regardless of the candidate's state of residence. SUNY Empire State allows nursing students to pursue an RN-to-BSN pathway online with on site clinical training components. Additionally, the college offers more than 500 standalone online courses that cover a range of academic disciplines; accelerated eight-week courses are also available online, as are a few master's degree programs. Tuition at NCCU is structured to provide flat rates for students who take a certain amount of credits. The first five credits for in-state undergraduates, for instance, are priced at $456.88. Students who take eight or 11 credits per semester can pay a flat rate. During the 2016-17 academic year, in-state students pay roughly $4,177 in annual tuition, while out-of-state and international students will pay roughly $10,406. Both of these figures amount to less than half of the national average. NCCU's online offerings include bachelor's degrees in four academic fields: hospitality and tourism administration, criminal justice, early childhood education, and an RN-to-BSN nursing pathway. Additionally, online master's degrees are offered in information science, library science, educational technology, and career counseling. Six online certificate programs are available as well. Oregon Tech does not charge out-of-state tuition for online students, allowing them to pay as little as $227 per credit hour, plus a $60 distance fee. The school also offers tuition reciprocity for students transferring from select community colleges in Northern California. Additionally, the 2015-17 budget plan for Oregon Tech includes initiatives designed to minimize tuition hikes and to increase affordability for students. As a technical college, Oregon Tech's online programs are grounded in STEM fields and healthcare. Students can pursue a bachelor's degree in one of five subjects: applied psychology, health informatics, information technology, operations management, and technology and management. A master's degree in allied health is available as well. Other options for distance learners include associate degrees and certificates in clinical health and polysomnography, two specialization programs, and seven degree completion programs. All Westfield State students must pay a non-refundable annual fee of $8,305. This fee allows the university to maintain low tuition rates for students; in-state residents pay $970 annually, while out-of-state residents pay $7,050 on a yearly basis; students from states participating in the New England Regional Program will pay $1,455 in annual tuition. Students over the age of 60 receive free tuition, as well. The university's master of social work program earned special recognition in March 2016 when the school topped Social Work Degree Guide's list of the most affordable MSW programs in the Northeast. Distance learners can pursue bachelor's degrees in business management, criminal justice, history, liberal studies, psychology, and sociology. These programs are geared toward students who have transferred from a Massachusetts community college program, and all coursework may be completed entirely online. Tuition at DSU varies by degree level and subject; on average, in-state students pay at a rate of $271.55 per credit hour; the school offers discounted tuition to residents from Minnesota and Iowa as well. Online undergraduate students pay $333.35 per credit hour, while online graduate students pay $442.05 per credit hour. Tuition for all online students is billed at a per-hour rate. Degree and certificate programs offered through [email protected] are largely concentrated in three core academic areas -- information technology, business, and education -- with a few crossover options, including degrees in fields like business technology, health information administration, and educational technology. In all, online students at DSU can choose from 12 bachelor's degrees, four associate degrees, seven master's degrees, two doctorates, and five professional certificate programs. Indiana State's tuition schedule is conducive for students who plan to take larger-than-average course loads. In-state undergraduates can take between 12 and 18 credits per semester for a flat tuition rate of $8,546 per year; those who exceed the 18-credit benchmark will pay $9,934 per year. Additionally, eligible students from 10 different states receive reduced tuition rates from the Interstate and Midwest Consortium Scholarship Programs. Out-of-state online students also receive lower tuition, at a rate of $10,768 to $12,516 per year (depending on course load). Indiana State offers a robust mix of undergraduate and graduate programs for online learners. Bachelor's students can choose from 18 online degree programs; these include two nursing pathways, two bachelor of applied science degrees, and six business-oriented programs. Thirteen online undergraduate minors and three professional certificates are also offered online. Options for online grad students include 21 master's degrees, two doctorates, four education specialist credentials, and 15 graduate certificates. Tuition at MSU Springfield varies by course format and level. Undergraduate courses for in-state students are priced between $205 and $288 per credit hour, while out-of-state students pay between $440 and $548. Even at their most expensive, these rates are significantly lower than the national averages. All online students pay a flat tuition rate between $285 and $420 per credit hour. Missouri State offers 11 online bachelor's programs, including a nursing degree completion pathway and a BS in health services degree with a clinical services focus. Two professional certificates for undergrads and 10 undergraduate minors are available exclusively online as well. A dozen master's degrees and two doctorates are also delivered in a fully online format; most of these options are in nursing or education-related fields. NKU's tuition schedule includes reduced rates for several student demographics. Residents of Ohio and Indiana pay $375 per hour, the same price as Kentucky residents. Students also receive reduced tuition when they participate in PACE, a year-round program geared toward working adults that consists of accelerated eight-week courses. Online students pay $410 per credit hour (plus a $35 distance learning fee), regardless of their state of residence. NKU offers ten online undergraduate degree programs. Most can be completed exclusively online within four years of full-time study. Popular programs include business information systems, criminal justice library informatics, and organizational leadership. Two professional certificates are also offered online, as well as an RN-to-BSN pathway and a respiratory care degree completion program. Graduate students can select from 13 online master's, doctoral and certificate/specialist programs -- most of which are offered in education, healthcare or business. Tuition at SUNY Oswego is much lower than the national average. In-state residents pay $5,170 in annual tuition, while out-of-state and international students pay $15,820. Additionally, the school annually awards roughly $4 million in merit-based scholarships to enrolled students. Available scholarships include a renewable $1,000 award for transfer students from community colleges, and a full-ride scholarship valued at more than $20,000 per year awarded to undergraduate STEM majors who demonstrate financial need. Two MBA programs are available for online students at SUNY Oswego: a general MBA, and an MBA with a health services administration specialization. Undergraduates can choose from online bachelor's degrees in broadcasting/mass communication, public justice, or vocational teacher preparation. Post-baccalaureate certificates are also offered online in behavioral forensics, health information technology, and integrated health systems. UMUC offers major tuition incentives to U.S. military personnel seeking an undergraduate degree. Currently all full-time military service members, reservists, and National Guard members pay just $250 per credit, as do members of the U.S. Public Health Service and the Commissioned Corps of the National Oceanic and Atmospheric Administration. This offer also extends to spouses and dependents of anyone who qualifies for the discount. The $250 rate is $34 less per credit hour than the tuition rate for in-state students. UMUC's online offerings include more than 90 web-based degree and certification programs. The bulk of the university's online programs are available for undergraduates, including 31 bachelor's degrees and 41 exclusively online undergraduate minors. Online graduate students can pursue 11 MS degrees, an MBA, four education-oriented master's programs, and two doctorates in management. In-state students pay roughly $6,350 in annual tuition under Thomas Edison State's comprehensive tuition plan, while out-of-state students pay $9,352. Both of these rates are significantly below the national averages. This plan allows students to register for up to 36 course credits over a 12-month span. Alternatively, students can also follow a per credit tuition plan, which allows them to pay for their education at a flat rate. Thomas Edison offers a wide selection of degrees and certificates for distance learners. This includes 11 associate degrees, 26 bachelor's degrees, 12 master's degrees, a doctorate, and more than two dozen undergraduate and graduate certificates. The vast majority of the college's online programs are concentrated in business or technology dimensions. The 2016-17 tuition schedule for EKU notes that in-state students pay $8,868 in annual tuition, while out-of-state students pay $18,180 per year. Distance learners pay a flat tuition rate, regardless of their state of residence. Most online students at EKU pay $400 per credit hour for their courses; the only exceptions are students in the online RN-to-BSN program, who pay $450 per credit hour. Online bachelor's degree opportunities for EKU students include core pathways in fields like psychology and political science. However, most web-based undergraduate programs cover niche areas of study, such as corrections and juvenile science studies; fire, arson and explosion investigation; homeland security; and occupational safety. An RN-to-BSN option is also available. EKU Online also offers four associate degree programs, 17 master's degrees, and doctorates in nursing and occupational therapy. A total of 19 professional certificates and endorsements are also available online, including 13 in professional education and four in nursing. In order to create the ranking of the most affordable online colleges, we scored each candidate school using a diverse set of criteria. This criteria fell into three categories, and each category carried a different weight for determining a school's overall score. The âExperience and Affordability' category evaluated each school's cost expectations for undergraduate students. We looked at two key cost variables. The first, average net price, is the total cost of attendance minus student loans, scholarships and other forms of financial aid. The second, average tuition price, measures total cost of attendance without factoring in financial aid. We also calculated each school's default rate, or the percentage of student loan recipients who are unable to make scheduled loan payments after graduation due to unemployment or low wages. The âExperience and Affordability' category carried a weight of 70%. For the âAcademics' category, we measured five critical student outcomes. Admissions rates signify the percentage of applicants accepted for enrollment. Enrollment rate represents the number of applicants who ultimately choose to attend that school, retention rate stands for the number of current students who stay at that institution year after year, and graduation rate measures the percentage of enrolled students that successfully complete degree programs. Student-faculty ratio signifies the number of current students for each individual faculty member employed at the college or university. The âAcademics' category was worth 15%. Finally, the âOnline Flexibility' category looks at the quality of a school's online offerings. We added up the total number of online degree programs, as well as e-books, databases and other online resources available to students. This category also included the number of students at a school who enrolled in at least one online course per quarter or semester. âOnline Flexibility' held a weight of 15%. The next section features a more detailed breakdown of the different factors that went into our methodology for ranking the most affordable online colleges. Average Net Price 40% Net price represents the total cost of college attendance. To calculate net price, first we totaled the costs of tuition, books and course materials, administrative fees and other essential expenses at each school. Then, we subtracted the average amount of financial aid from this total. A net price is key for understanding how much a student should expect to pay out of pocket for attending courses at a given college or university. Average Tuition 40% Unlike net price, average tuition refers to the total cost of attending courses without factoring in financial aid. Tuition is seen as one of the most prohibitive reasons for not attending a given school, and institutions with lower tuition rates tend to attract a more diverse pool of students. It's important to note that many schools offer different tuition rates for students based on their state of residence; those who hail from out-of-state tend to pay more in annual tuition than those who reside in the same state as their college or university. Many cheap online colleges will waive out-of-state rates, making tuition more affordable for students based in a different state. Average Default Rate 20% Roughly two-thirds of today's college students receive financial aid. Some forms of aid, such as student loans, must be paid back to the financial aid provider once the student has completed their degree program. Default rate refers to the percentage of students who are unable to make scheduled student loan payments due to unemployment or low wages. A low default rate signifies a school's ability to turn students into top job candidates. Admissions Rate 20% Admission rates are useful for determining the selectivity of a given school. Colleges and universities with low admission rates are considered highly competitive, while schools with high admission rates are considered less selective. According to USNWR data, the most selective colleges and universities have admissions rates ranging from 6% to 32%; comparatively, the least selective schools have admissions rates that fall between 93% and 100%. Enrollment Rate 20% Unlike admissions rate — which measures the percentage of applicants who are accepted into a college or university each term — enrollment rate represents the percentage of students who choose to enroll at a given school once they have been admitted. Institutions with a high enrollment rate demonstrate an ability to attract prospective enrollees and ultimately convince them to enroll at that particular school. Factors that affect a student's enrollment decision may include tuition prices, campus resources and facilities, student housing and/or student-faculty ratio. Retention Rate 20% Retention rate represents the percentage of students that choose to continue their studies at the same school after each academic year passes. Retention rates are often measured using graduating classes, and track each class over four years of undergraduate studies. For example, retention rates for the Class of 2017 were first measured in 2013-14, that class's freshman year. Schools with high retention rates offer the academic strengths, resources, services and perks that keep students coming back year after year. Graduation Rate 25% Graduation rates measure the total number of students that complete their coursework and graduate with a bachelor's degree within six years of beginning their education. Graduation rates are directly linked to the quality of education at a given college or university, as well as services designed to support struggling students and help them raise their grades. High graduation rates indicate that the majority of students at a given college are either excelling in their courses or taking the steps necessary to improve their academic performance. Student-Faculty Ratio 15% The student-to-faculty ratio represents the number of students enrolled at a given school for each current professor or faculty member. This ratio is important for determining the level of individualized attention students receive from their teachers. A school with a student-faculty ratio of 30 or less is much better equipped to engage students and address their individual concerns than a school with more students and fewer faculty members. Total Number of Online Media 30% Learning management systems and educational software are cornerstones of the online college experience. The best online colleges offer tools and platforms that are engaging, functional and user-friendly. They also provide students with supplemental resources to aid their studies, such as e-books, online journals and periodicals, and databases and datasets. Many online postsecondary institutions utilize the same learning management systems; the most popular programs include Moodle, Blackboard, Edmodo, ConnectEDU and SumTotal. Number of Online Bachelor's Programs 40% Colleges and universities with a wide range of degree programs are equipped to serve a diverse student population. Degrees in certain fields of study — such as business, education and healthcare — are found at the vast majority of U.S. colleges and universities. The top schools also offer degree programs in niche areas of liberal arts, social sciences, the humanities and STEM subjects. Percent of Students Participating in Online Classes 30% The percentage of students enrolled in at least one online course per semester or quarter is tied to the overall popularity and perceived quality of a school's online offerings. A higher percentage of college online enrollees also generates more feedback, allowing schools to modify and improve their web-based programs based on the input of different students. According to Fall 2014 data from U.S. News & World Report, roughly 5.8 million college students were enrolled in at least one online course that term. For many students, the cost of attending college — even the cheapest online colleges — will extend way beyond the sticker price. This section will cover important college expenses to consider before selecting an online degree program, as well as some strategies for creating a feasible budget and paying for the essentials while you're in school. Tuition represents the total, per-credit cost of attending college courses during an academic term. According to USNWR data, average annual tuition costs include $9,130 for in-state students at public schools, $21,303 for out-of-state students at public schools and $33,635 for students at private colleges and universities (regardless of their state of origin). It's important to note that course credits for the cheapest online bachelor's degrees are often more expensive than brick-and-mortar course credits for in-state students; however, many online colleges waive out-of-state tuition rates in order to attract web-based students from across the country. Application Fee: Prospective students are usually required to pay a fee when they submit their initial application. Most of these fees range from $20 to $50 dollars per application. Technology Fee: Online and on-campus students will both be assessed a technology fee, which covers computer labs and other tech-related student resources. This fee usually ranges from $25 to $80 per credit hour. Graduation/Diploma Fee: This fee covers paperwork, filing and other administrative tasks associated with students who are set to earn a degree. Graduation and diploma fees usually run between $25 and $100 per student. Matriculation Fee: Also known as an enrollment fee, this cost widely varies by institution. Some schools charge higher matriculation fees when students initially enroll, while others charge lower matriculation fees for each semester of enrollment. On-campus student housing can be quite expensive. According to COLLEGEData, the average undergraduate student paid between $10,138 (public) and $11,516 (private) for room-and-board during the 2015-16 academic year. Off-campus options are typically more affordable, although students should still expect to pay at least $600 to $900 per month in rent and utilities. You can cut down on monthly housing costs by sharing units with multiple roommates. Online students are in a unique position when it comes to college housing. Since they do not have to commute and are able to study from anywhere, many choose to remain living at home with their parents or guardians. Others may choose to live in communities with lower housing costs than the cities or towns where their campus is located. Check out our college housing guide for more information on housing options and tips for saving as a student resident. College textbooks and supplemental course materials can run up a rather lengthy bill each semester. Students should expect to pay roughly $1,200 per year for required books — and single volumes can cost up to $200 apiece. You can save some money by purchasing used books when available, although you should still plan to spend at least $200 to $300 per semester. Many schools (including cheap online colleges) have textbook buyback programs, but expect to receive 50% or less of the original sticker price per book. Online students may or may not be required to purchase physical textbooks, depending on the individual course. May instructors make materials available completely online. However, online students may also face additional fees. These include purchasing a PC or laptop, computer maintenance and monthly in-home Internet costs. Students who attend on-campus courses must pay commuting costs, and those who choose to drive their own vehicle must also cover campus parking fees. Online students are at a distinct advantage, since their coursework may not require any campus visits. Those who must travel to campus occasionally can cut down on commuting costs by utilizing public transportation (such as buses or subways) or carpooling with other students and dividing the parking fees. During the 2014-15 academic year, roughly two-thirds of U.S. college students received financial aid. The bulk of financial aid available to today's students can be divided into three different categories. Scholarships: Thousands of scholarships are available to today's students. Some are merit-based, and awarded to students who have recorded certain grade point averages or academic achievements; others are need-based, and reserved for students who demonstrate financial need. Scholarships are often earmarked for students in certain major fields of study, as well as female students or students belonging to certain racial groups. Scholarships do not need to be paid back after the recipient has graduated, making them an ideal financial aid option for today's students. Grants: Like scholarships, grants do not need to be paid back. Grants are almost always need-based, and are available through the federal and state governments, nonprofit organizations and learning institutions. Many undergraduates receive Federal Pell Grants, which award up to $5,815 per students on an annual basis for four years of study. Loans: Two types of student loans are available: federal and private. Federal loans are provided by the U.S. government, and carry a fixed interest rate and more flexible payment plans. Private loans, typically offered through banks and lending institutions, usually carry a variable interest rate and stricter payment plans. Today's college experts urge students to apply for federal loans first, and to use private loans as a last resort. For more information, please visit our financial aid guide for online students. Buy used textbooks: Used materials are available in most campus bookstores, although you may need to buy some new books. Use public transportation if possible: In addition to lower per-travel costs, many public transportation systems operating in campus communities offer student discounts. Use student discounts: Towns or cities where college campus are located are often populated with businesses and facilities offering student discounts. Be sure to inquire about student discounts when you're out and about. For more information about cutting costs and reducing college expenses, please visit our Graduating Debt Free Guide.